Chem-Dry Clean & Fresh Carpet Cleaners Pennant Hills utilises a highly effective and unique carbonated cleaning system that is safe for the entire family. Green Certified Non-toxic products means our process will not harm your kids or pets. Your Carpets will be left Sparkling Clean & Fresh, not soaking wet like some of the other cleaning companies. 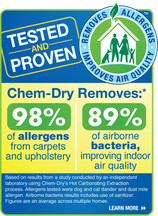 Chem-Dry uses 80% less water than typical steam cleaning so carpets dry in hours instead of days, making it the safer and more convenient carpet cleaning method available 6 days of the week. Indoor air quality is a significant home health concern because the average home harbors about 200,000 bacteria for every square inch of carpet. As the bacteria builds up, the bacteria lurking in your carpets gets stirred up and circulates in the air your family is breathing unless you clean it. Chem-Dry Clean & Fresh Carpet Cleaning Pennant Hills is not only effective at removing the bacteria from the carpets we clean, but it also improves the air quality in your home. The same leading independent air quality laboratory found that, when adding sanitizer to our Hot Carbonation Extraction carpet cleaning process, we removed an average of 89% of the bacteria in the air and 82.3% of the bacteria from carpets.